The designing process is different for everyone. Some know exactly what they want, others need guidance and direction. I’ll walk you through the process of creating your one of a kind, unique design. Something created especially for you! Using both old world techniques and new world technology, my detail-oriented approach focuses on wearability, durability, longevity and budget. Let’s create a beautiful heirloom together – one that will stand the test of time for generations to come. I love to upcycle and redesign my client’s old pieces of jewelry. They are surprised and delighted in the transformation of the unused or forgotten. Take a look in your jewelry box and give me a call! 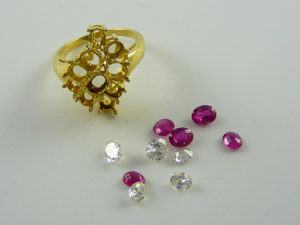 Incorporating any diamonds, gemstones and precious metal you might have, I’m able to provide you options in a wide price range. Great examples of outdated, unused jewelry are old engagement rings, inherited jewelry, broken chains, lone earrings, class rings, corporate jewelry, etc. Basically anything you aren’t wearing. Recycling is not only a more affordable option, it’s also good for Mother Earth! 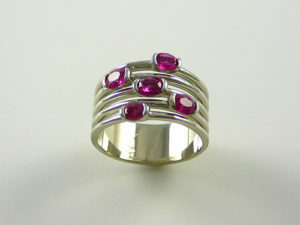 A mother gifted a ring to her daughter, who designed a beautiful ruby ring for herself. She then kindly gifted the diamonds to her sister. From this single gesture, two sisters will enjoy the memory of their mother every time they wear their new jewelry. 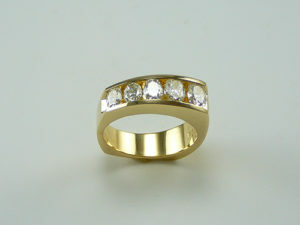 Having made several pieces of jewelry for this family, I have no doubt they will be enjoyed for generations to come!